Community Colleges provide two or more years of education after high school. 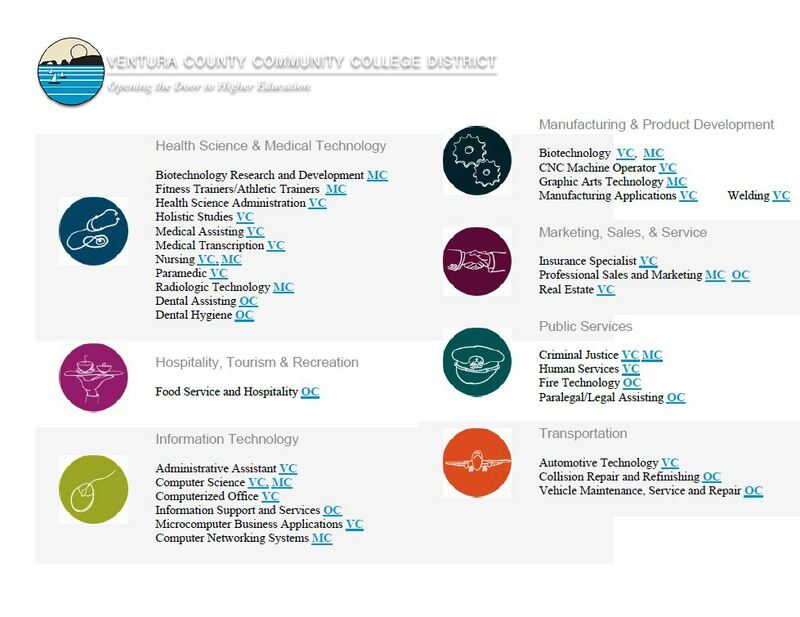 Ventura County is served by three community colleges: Moorpark, Oxnard, and Ventura. Students may attend any community college in the state. 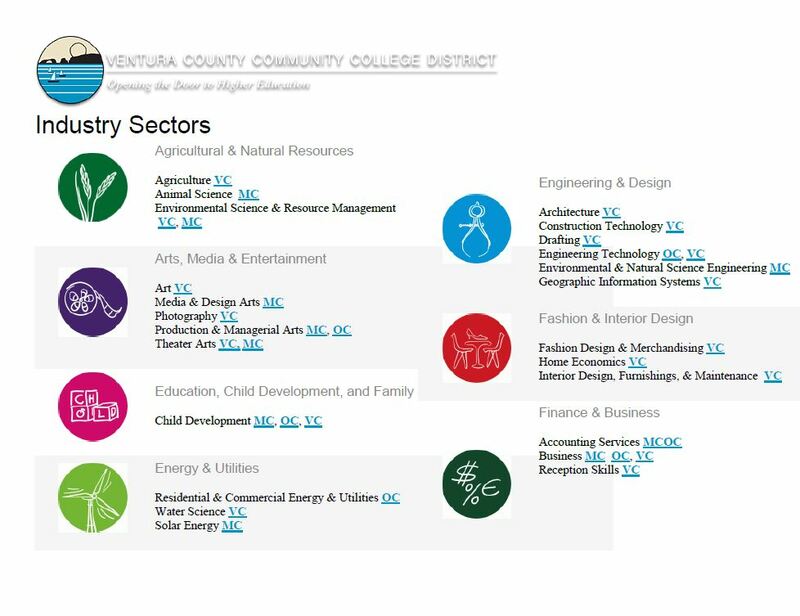 Besides providing high school makeup and technical and vocational programs, some of which lead to the Associate of Arts (AA) or Associate of Science (AS) degrees (two year college diplomas,) the community colleges offer the first two years (60 -70 units) of the four-year college program through the transfer program to a UC, CSU, or private college. To be eligible for admission at a California community college, students must meet one of the following conditions: be 18 years or older with or without a high school diploma, be a high school graduate, or have the equivalent of a high school diploma. Students do not need to take the SAT or ACT, nor do they need to meet the "a-g" requirements of a 4 year institution. Save Money on Tuition: Attending community college before completing your bachelor’s degree at a four-year institution can save you a sizable amount of money. Tuition and fees at public community colleges average less than half of those at public four-year colleges and about one-tenth of those at private four-year colleges, according to the American Association of Community Colleges. Complete Your Basic Requirements: You’re going to have to get your general graduation requirements out of the way one way or another. Community colleges are good places to earn these credits. The faculty at community colleges tend to focus more on teaching than research, which means you’ll get help in subjects you struggle with. Time to Define Your Major: Many students don’t know what to major in when they graduate from high school. Two out of three students will change their major at least once during their college career. Community colleges are good places to explore fields that interest you before committing to a major. You’ll save money by paying less per credit than you would at a four-year school while taking time to explore your options. An Opportunity to Transfer to a Prestigious UC/CSU: If you don’t have the highest GPA after graduating high school, you may not attain the rigorous standards to be eligible for admission as a freshman to a prestigious four year university. However, students may become eligible to transfer to a prestigious four year university by completing the Intersegmental General Education Transfer Curriculum (IGETC), a series of courses transfer students may complete to satsify the lower-division general education requirements at both the UC and CSU. Visit the ﻿Assist﻿ website for more information about the IGETC. If you are interested in this option, make sure you make an appointment with a community college counselor to learn all of the requirements and to map your way to the four year university of your choice. Save Money by Living at Home: Room and board make up a significant percentage of college costs at four-year colleges. Living at home can save considerable amounts of money.